In recent years, the visits of British politicians to Japan have been accompanied by a common refrain: that the country is the UK’s “closest security partner in Asia”. Indeed, Prime Minister Theresa May reaffirmed that sentiment during her August trip to Japan and included a visit to the JS Izumo in Yokosuka as part of her itinerary. Underpinning that alliance has been greater technological exchange, as well as increased opportunity for British defence firms in Japan. Providing a venue for further cooperation was the Maritime/Air Systems & Technologies (MAST) trade show and conference, which took place at Makuhari Messe in Chiba on 12–14 June. Among those present were representatives and firms from the UK, as well as other European countries and Asia–Pacific nations, including Japan, the United States and Australia. “MAST Asia has been an important event for senior military professionals to engage with their international partners”, Royal Navy Captain Paul Casson OBE, the defence attaché at the British Embassy Tokyo, told BCCJ ACUMEN. “The UK is engaged in the region and the event was an excellent opportunity in burgeoning these relationships”. The trade show was held against a background of increasing economic importance and militarisation of the seas in the Asia–Pacific region. According to the Asia-Pacific Defense Outlook 2016 report published by Deloitte Tohmatsu Consulting LLC, 50% of global container traffic now moves through the area, where naval budgets are expected to increase 60% by 2020. At the same time, in the East China Sea China has challenged Japanese control of the Senkaku Islands, while in the South China Sea it has embarked on a series of island building projects—some of which the Permanent Court of Arbitration in the Hague found, in 2016, to have breached the United Nations Convention on the Law of the Sea. These developments have unnerved other Asia–Pacific countries. In response, the United States has conducted Freedom of Navigation Operations near Chinese-controlled islands in the South China Sea, and Defence Minister Michael Fallon KCB has suggested that, next year, the UK will do the same. With increased naval attention on the Asia–Pacific, MAST was attended by a number of high-ranking officers, among whom was Rear Admiral Paul Bennett CB OBE, the Royal Navy’s assistant chief of naval staff (capability). Alongside counterparts from Japan, the US, France and Australia, he spoke at a keynote address on maritime cooperation in the Asia–Pacific, addressing points related to the Royal Navy’s presence in the region. “Cooperation is absolutely something the UK takes extremely seriously, and we will continue to contribute as much as we can in this hugely important strategic region”, he said in his opening remarks. Detailing some of the ongoing and planned cooperation between the UK and allies in the area, Bennett mentioned the country’s key role in the Five Power Defence Arrangements (an agreement among the UK, Australia, New Zealand, Singapore and Malaysia) and the planned visit of a Royal Navy frigate to South-East Asia and Japan next year. He also expressed hope that the UK would be able to further develop its relationship with Japan across both the Ground and Air Self-Defense Forces, particularly with the establishment of an amphibious brigade in the Western Army. Rear Admiral Paul Bennett CB OBE (second from right) spoke about maritime cooperation in the Asia–Pacific. “In this 35th anniversary of the Falklands War, we should of course not forget—we certainly don’t in the Royal Navy—that amphibious warfare is not just about the marines—it is about fusing the capabilities of land, sea and air forces to bring effect from the sea, and it is a very important thing for any maritime nation to be focused on”, he said. Shifting geopolitical realities and trade relationships are also playing a role in enhancing maritime cooperation in Asia. “As the UK leaves the European Union and seeks new trading partners, the economic pull of this region will only grow, and so, too, our commitment to its security”, said Barnett. However, he noted that the Royal Navy’s operational schedule is currently focused on Europe and the Middle East. Nonetheless, such operations—particularly with regard to anti-submarine warfare—maintain a relevance to the Asia–Pacific. “That underwater threat can easily be applied to the South-East Asian region, and so as the Royal Navy returns to global task group deployments, I think our new Type 26 frigates and the Queen Elizabeth-class carriers will play a vital role in multinational operations”, Bennett said. The rear admiral then turned to the nature of maritime engagements in the future and the capability that they require. “Sometimes navies face pressure to focus on maritime security and humanitarian duties at the expense of capabilities required to deter and defeat the less immediate, but potentially far more serious, conventional threats—I think we see that tension playing out in this region and during this conference already. “The navy’s view—I’m sure shared by everyone in the room—is that we need to be able to deliver that soft touch of preventative engagement, and the hard punch of maritime military power when required. It’s not about choosing between the two. “It is what’s guiding the Royal Navy’s modernisation”. To that end, the Royal Navy is set to bring into service a range of new vessels and vessel classes over the coming years. But Barnett also stressed that technology has an important role in delivering greater capability at a lower cost, saying, “I see us on the verge of extraordinary opportunity”. “Autonomous unmanned systems will extend our reach, machine learning will speed up decision making, direct energy will help us counter developments in missile technology and allow us high-probability, low-cost self-defence, as required. Additive manufacture and data analytics will revolutionise how we support and sustain maritime operations. “The Royal Navy, in partnership with many in the room, is exploring these technologies at pace. We certainly don’t have a monopoly on good ideas and are really keen to share your views on how we can develop these technologies as quickly as possible. “As we seek to work more closely together, commonality, modularity and interoperability will be vital”, he concluded. Some of the firms powering the shift that Bennett described were present at the UK’s pavilion overseen by the Department for International Trade’s Defence & Security Organisation, with participants ranging from stalwarts such as Rolls-Royce Japan Co., Ltd. to relatively new digital firms. 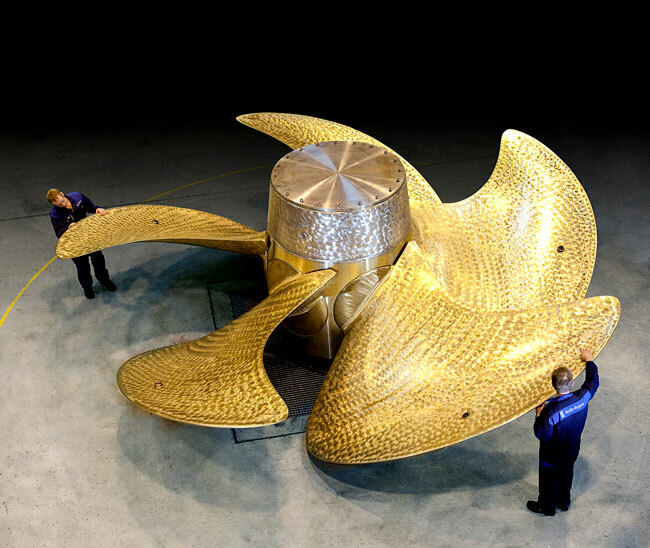 Rolls-Royce produces the propellers for the UK’s new Queen Elizabeth-class aircraft carriers. “We’ve been involved in Japan, engaged in Japan for a really long time”, said Will Erith, then vice president naval–Asia Pacific at Rolls Royce, noting that the firm has enjoyed a partnership with Kawasaki Heavy Industries, Ltd. for more than 50 years. “There are obviously a lot of opportunities and that’s why we’re interested in this country and this market”. For Rolls-Royce, that means the firm’s gas-powered turbines, which are used to give vessels propulsion and have been used by the Japan Maritime Self-Defense Force for decades. It is also an example of the kind of specialist technology that can find a strong position within the Japanese market. “The barriers to entry for that type of technology are huge”, said Erith. “So that’s the kind of unique offering that we have, and then we partner with Japanese industry and they bring complementary capabilities in terms of packaging and integration, and some of the things that are unique in the Japanese market. “We know we’ve got technology and products that are world leading and that, in combination with a Japanese partner, are a really great offering and keep us here, keep the market open to us in the long term”. But not every firm present at MAST was there to promote hardware. As Bennett noted in his speech, digital technology is of increasing importance in the maritime space. Representing that trend at the UK pavilion was Bristol-based firm BOXARR Limited, the creator of a software platform for collaboratively mapping and analysing complex inter-dependent systems. BOXARR already has among its customers the likes of the UK Ministry of Defence, BAE Systems plc, Rolls-Royce, Airbus SE, the Boeing Company and the US Department of Defense. “Our platform is a means of visualising and analysing complex challenges on a massive scale, that can reflect real world problems, such as the ‘systems of systems’ in a warship, submarine or an aircraft; or the complex inter-dependencies across army, navy, and air force operations and supply-chains”, explained Fraser Hamilton, the firm’s vice president for global alliances. “BOXARR helps these organisations to identify and mitigate risk and simulate the impact of planned or unforeseen changes to enhance their operational performance”. MAST represented both Hamilton and the firm’s first visit to Japan, providing a chance to further develop its relationships within the Asia–Pacific region, and examine where BOXARR could build partnerships with local consultancies and establish customer engagement. Hamilton saw BOXARR’s value potential in Japan as significant, saying, “We have delivered powerful capabilities and solutions into European and US organisations that could quickly and effectively be transferred into the Japanese Ministry of Defense and the broader Japanese defence industry. “Though our native markets are in aerospace & defence, BOXARR is not a sector-specific solution or tool; it can be applied to any complex organisation or challenge. We see significant growth potential across other sectors such as government, enterprise, healthcare, energy and automotive, areas where we are already gaining traction”, Hamilton added. Also present at MAST was British Chamber of Commerce in Japan Executive Committee member Richard Thornley CBE in his capacity as Bell Helicopter K.K.’s managing director of Japan. He spoke with BCCJ ACUMEN about the opportunity Japan represents for non-Japanese firms.“It’s a very big opportunity because Japan wants to procure the best defence equipment available and has sufficient budget to do that”, he said. “Possibly because of the threats that surround Japan, this is one of the more interesting areas in the world from a defence perspective”. In part, what has given international defence firms an edge in Japan is the economies of scale that they derive from the large production runs that come with significant defence exports. 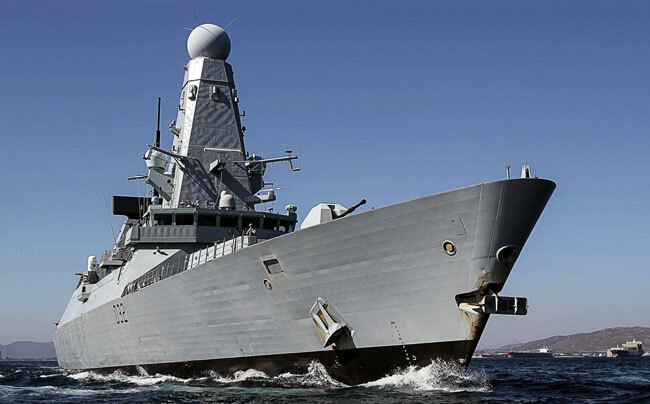 On a rolling 10-year basis, the UK is the second-largest defence exporter in the world, according to British government figures published in July. “What Japan hasn’t been able to do until recently is export defence equipment to get the necessary large production runs that are needed to keep the unit cost down”, said Thornley. “With just purely the domestic market, the production runs are naturally limited, and that tended to make their production costs more expensive, but Bell Helicopter is collaborating with Subaru to increase competitiveness and export potential”. Another important consideration for British firms is that selling to the Japanese market is not just about Japan. Indeed, it represents a strong platform for exporting to other Asian markets as well. “[The Japanese] perform their procurement process in the most professional way with great rigour, and they choose the equipment that best meets their needs”, said Thornley. “The professionalism of Japanese procurement is actually highly regarded by other Asian countries and they tend to follow the Japanese lead in their procurement, because they know it has been done thoroughly and there’s likely to have been a nice, clean and good decision in their procurement”.